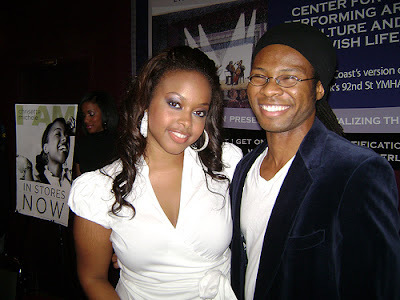 This weekend I had the honor of attending the Musiq Soulchild/Chrisette Michele concert. Thanks to Def Jam for hooking me up with tickets. The show was excellent all around. Chrisette opened up with an assured vocal performance. The crowd was still small but she made the best of it. Her voice was amazing. Just how you would imagine her sounding. Just like the album with that little bit of grit that makes her sound so appealing. The highlight was when she played away on the piano to the gut wrenching ballad "Love Is You". After the show Chrisette went out into the lobby to sign autographs and talk to new fans. She is quite adorable in person. She is really young but you would never know it from that old voice of hers. Musiq Soulchild killed it. I never knew he could sing so well. His band was amazing dropping some classics as well as some new cuts. The new tracks were pretty damn good, ramping up the energy. The best part of the show was when he got everyone to stand up so the normally chill LA crowd could get their dance on!